We love the Path of the Wolf Spirit Paint by Number Kit. The Artwork is fantastic. It features a pack of Wolves including two darling Wolf Pups walking on a cliff above an Indian village. An Eagle is soaring above them. Included in this Kit is 10 Paint Pots, 1 Preprinted Board, 1 Preprinted Practice Sheet and 1 Paint Brush. Recommended for ages 8 and up. 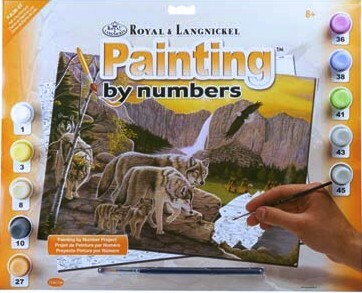 Makes a fun project and great Wolf gift for a budding young Artist.